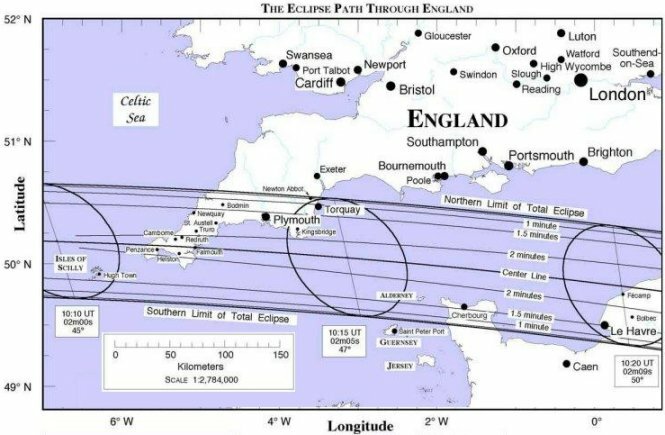 On Wednesday 11th August 1999, at around 11.15am, a total solar eclipse swept over Devon and Cornwall on its way across Europe and down into Asia. It was the first Britain had seen since 1927, and the last we will see until 2090. I had decided some time ago that I was going to travel down to the south-west to experience the totality - this was, after all, the final total eclipse of the millennium and the only one in the UK during my lifetime. However, when I enquired about rail prices I was horrified by the mark-up the rail company was making on standard fares for the day and walked away from the ticket office intending to give it a miss. But then I suddenly realized why I had to do it regardless, so I turned on my heel and bought the ticket. That was about five weeks previous and, early on the morning of 11th August, I set out for London's Paddington railway station and the train to Torquay, the only sizeable town within the totality I had a realistic chance of getting to before the big event, I'd decided after much poring over railway timetables. It was a glorious day when we pulled out of London, but the further south and west we got the more overcast the skies became. This was not good. As we plunged ever deeper into Devon, we got to see into many back gardens and it looked like the whole of the county were out in their gardens, eyes turned to the cloud-covered sky. It's been a long time since I last travelled to Devon and I'd forgotten just how beautiful it is, particularly from Dawlish on, the train seeming almost to ride on the water as it skirts Teignmouth bay, only a small wall hard up against the tracks keeping us and the water apart. It was on this stretch of track that I got my first glimpse of the eclipse as the clouds momentarily parted — a full third of the Sun's disc had already been swallowed. I had to switch trains at Newton Abbot and in the twenty minutes or so I waited for my connection I got a few more glimpses of the eclipse, ever more of the Sun having been eaten with each new sighting. (I also got to see a large billboard advertising 'Blackthorn's Cider — official sponsors of the 11th August 1999 Eclipse.' Heh.) Having checked the timetables carefully I figured that as long as the train was on time it would get me into Torquay about two minutes before totality. This was cutting it extremely fine but it was, and it did. One thing about the eclipse that really surprised me was just how much of the Sun had to disappear before conditions changed from looking merely overcast into something that was clearly twilight, though with an oddly metallic tinge. This it did as the train pulled into Torquay station and I and my fellow passengers ran for the exit, ushered through the open barriers by laughing staff who, sensibly, did not hold us up by asking for our tickets. The station was maybe a hundred yards from the seafront and we could see crowds of people over there, but with only seconds to go there was no time to join them. Thanks to our understanding of celestial mechanics we've known precisely where and when this eclipse was going to occur for decades, but the chaotic motion of clouds is far less predictable than the clockwork of the heavens. Were we going to see anything or were the clouds going to deprive us of a sight not to be seen again on this island for almost another century? It was all down to random chance and, for the most crucial two minutes of the day, random chance went our way. The clouds thinned and we saw the final sliver of the Sun shrink down to nothing and vanish as all went dark. A great cheer went up from the thousands lining the seafront along the great arc of Torbay accompanied by the flashing of hundreds of cameras. I took the opportunity to trot on down to the seafront and was there, among the multitude, as the Sun reappeared, a single dot of light that quickly grew into a thin arc as the darkness went away and daylight returned to the accompaniment of the whup whup of an ITN news helicopter as it swept over the bay. Almost immediately the clouds closed in again and, apart from one or two very short glimpses over the next hour, that was the last we saw of the eclipse, not that most people seemed interested now that the main event was over. But that was OK. When it mattered the most the clouds had parted to let us see something quite spectacular and strangely moving. The event itself, and sharing it with all those thousands of people, is something I shall never forget. It may be the closest this non-believer will ever get to having a religious experience. My father died a little over three years ago. As a family, we've never had much money and, anyway, my mother is still living in the house they shared so I had no expectation of inheritance. He did, however, request that token sums go to me and my two siblings and that we should spend these on something to remember him by. I'd never been able to think of anything suitable enough until that morning outside the ticket office five weeks ago when I suddenly remembered his request. In 1969, I stayed up until the early hours of the morning with him and my brother to watch Neal Armstrong step out onto the surface of the moon. Dad always had a fascination with such things and, had he been able, I'm sure he would have been there with me in Torquay, watching as the Sun went away and day briefly became night. I think he would have approved how I chose to remember him. - Rob Hansen, 11 August 1999. Originally written as a post for the newsgroup rec.arts.sf.fandom on the day the event happened, this piece was sufficiently well-received that Geri Sullivan requested it for her fanzine IDEA where, after a little bit of tidying up, it duly appeared in issue 12 (November 2000).